As we settled in Emée’s beautiful apartment at the heart of Vienna after an 8-hour long flight from Delhi, the bell from the nearby church announced that it was four in the afternoon. Though jet-lagged, Urmi and I decided to take a stroll to explore the neighbourhood. Little did we know that we were about to walk on the most magnificent road in the city! 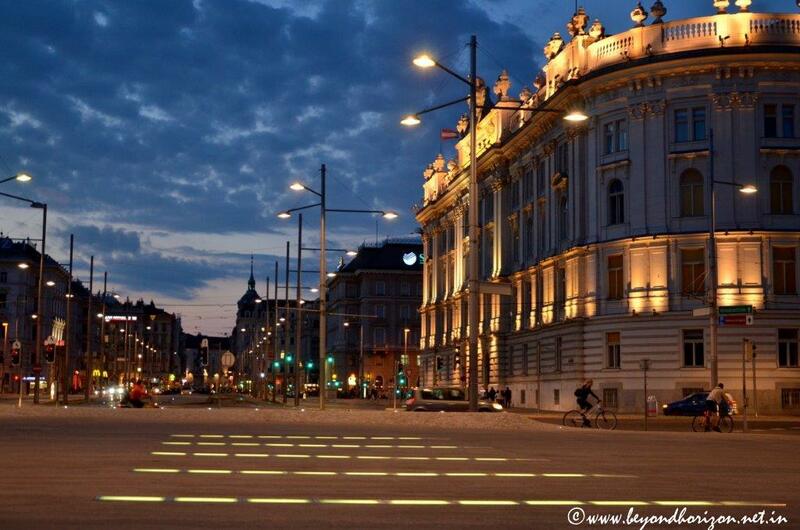 Ringstrasse (Ring Road), a grand circular 5.3 km long boulevard surrounding the imperial city center of Vienna, was a gift by Emperor Franz Josef I in the 19th Century. It was designed along with many magnificent buildings on both sides of the road and was intended to showcase the glory of Habsburg Empire. Apart from the main carriageway, each side has a Service Road, two rows of trees, two walkways and a cycle track. Our first stop was the Rathaus (Town Hall), a 19th century magnificent building in Gothic style architecture. 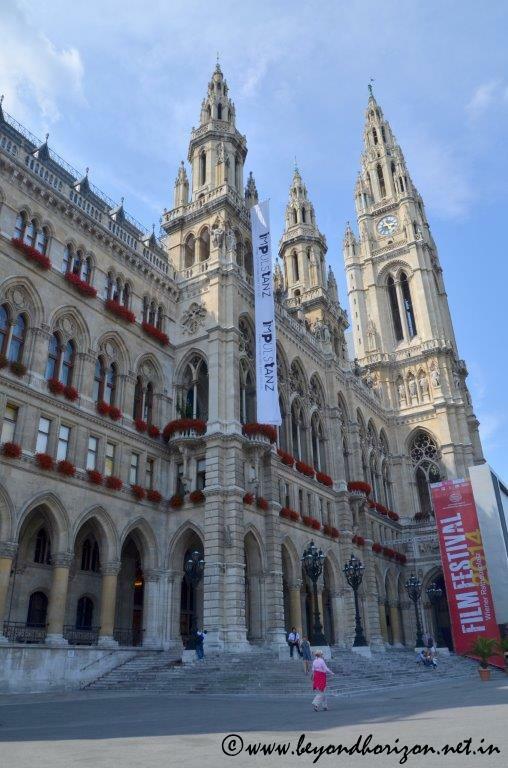 A month-long open air film festival was taking place outside the Rathaus. The beautiful garden in front of it – Rathauspark – had a pulsating environment with a variety of kiosks and people of all ages enjoying food and drinks or simply relaxing. Little away from Rathaus was the Austrian Parliament, a Greek Revival style building with great columns and a 4 m high curving ramp. 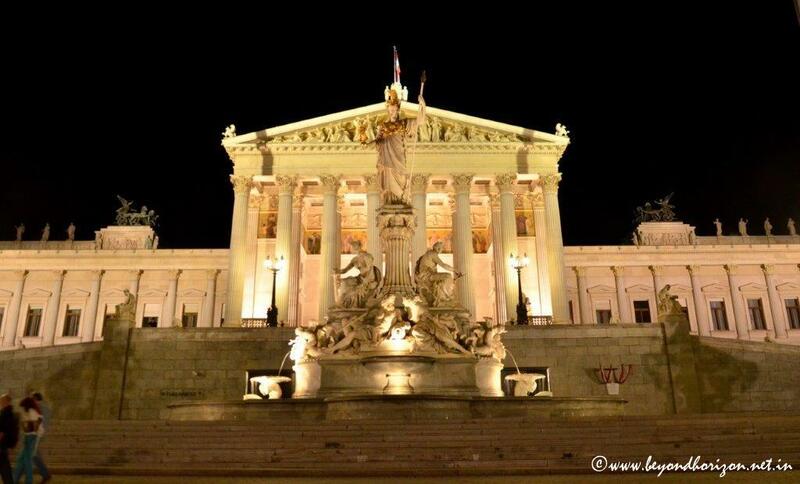 A beautiful fountain in front of the building represents the four most important rivers of the Austro-Hungarian Empire. Walking clockwise along Ringstrasse further down, on the other side of the road, was a large building with marble exterior, the Burgtheater. Built in 1888 in Italian Renaissance style, it is the most famous German theatre venue not only in Austria, but in the world. A horse drawn carriage with glittering brass embellishments carrying some tourists passed by, the joy of experiencing the old-world charm evident on their faces. 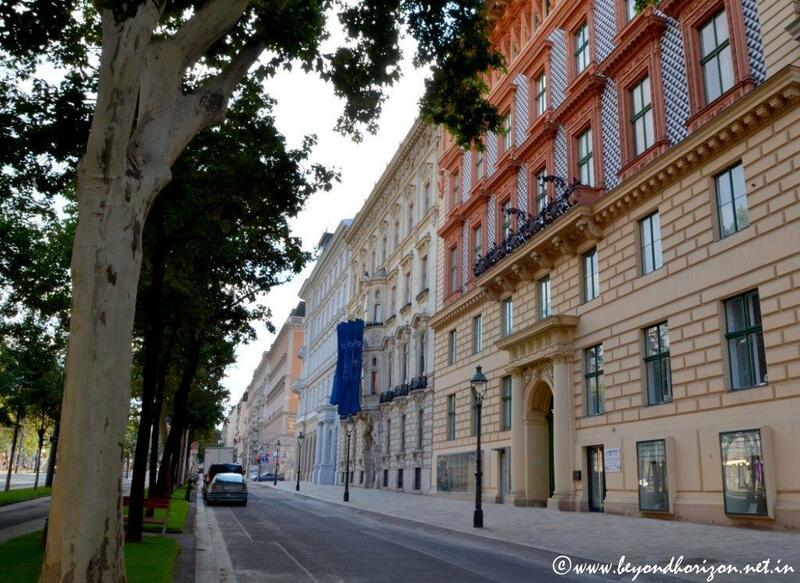 Leafy green trees and manicured flowerbeds along the road makes it a pleasure to walk along Ringstrasse. There were rows of grand buildings, many decorated with flowers or beautiful statues. We felt like being in a different time in history. Not far from there was the University of Vienna. Founded in 1365, it is the third oldest university in central Europe, though this building was built only in 1877.As it was late in the afternoon and probably past class hours, a group of students were sitting on the steps and chatting enthusiastically. It reminded me of my university days – students are the same everywhere! A little ahead along the tree-lined walkway, was the magnificent Votivkirche (Votive Church). Built in neo Gothic style with two narrow towers, it was conceived as a thanksgiving after Emperor Franz Josef survived an assassination attempt on his life in 1853. Just opposite Votivkirche was Schottentor, a tram and U-Bahn station with bright and colourful shops selling fast food and souvenirs. We were getting hungry, but too excited to stop as we wanted to explore for some more time. Further ahead was the Börse, the Stock Exchange Building, built in 1877. 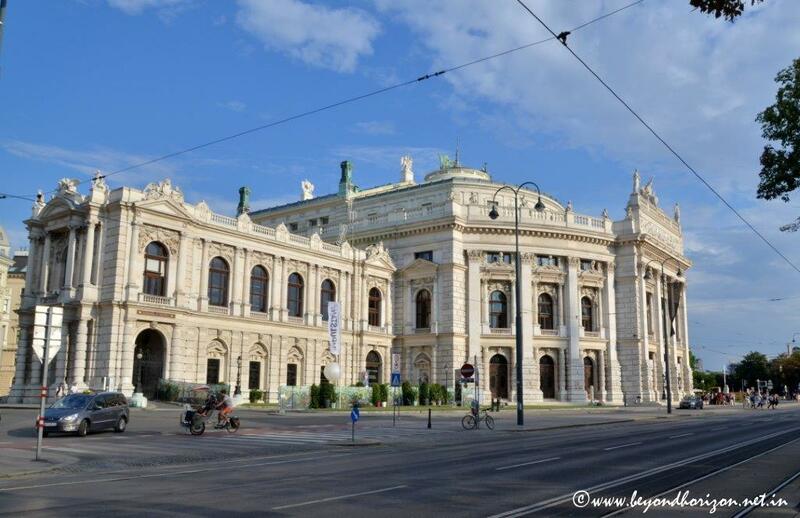 Interestingly, Börse, along with the Parliament and Burgtheater, was designed by the same architect, Theophil Hansen. 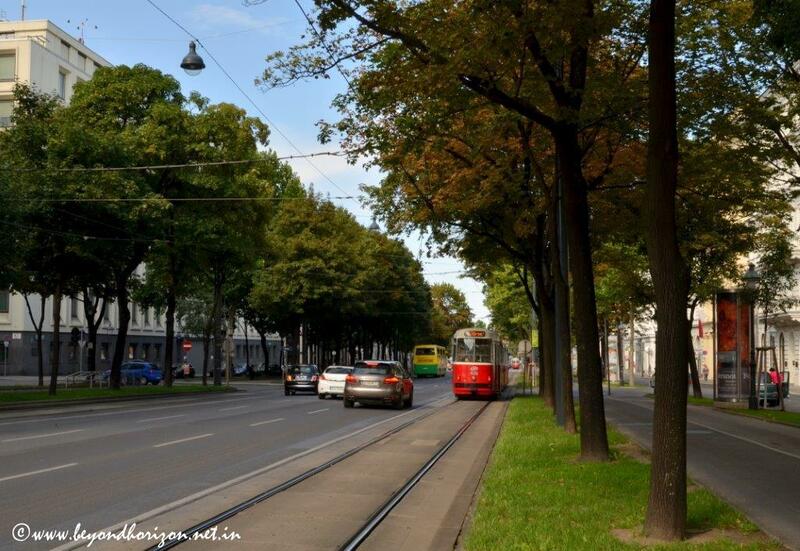 While walking on Ringstrasse, one of the most enchanting sights was the old-fashioned bright red trams rolling down the sides of the road, their distinctive metallic alarm bell reminding us of a bygone time. 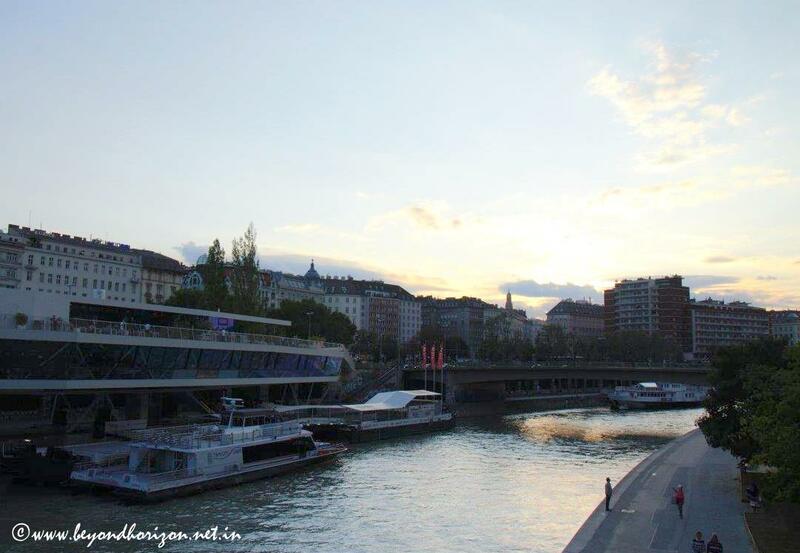 From the northernmost point for about 1 km, Ringstrasse runs along Donaukanal, a waterway connected to the Danube River. There was a pier from where boats were leaving for Bratislava, capital of Slovakia, not very far from Vienna. Crossing the canal walking over Marienbrücke (Marien Bridge), one can explore the town beyond the inner city. 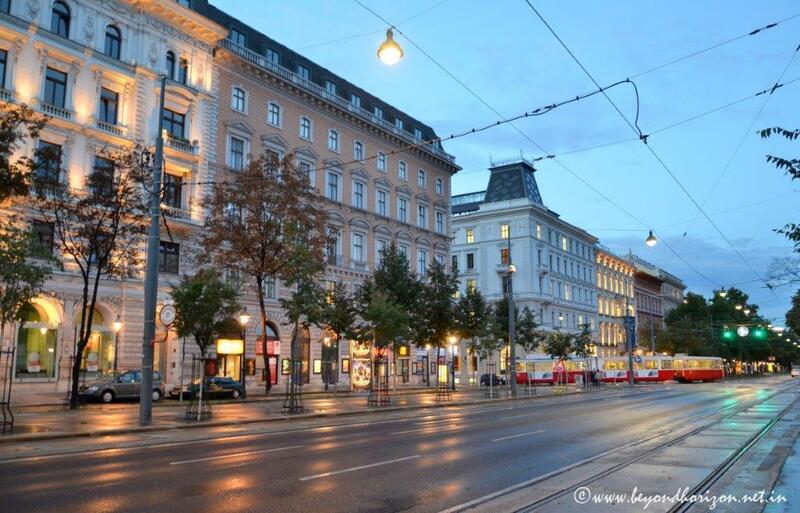 We were getting tired and thought the best course was to take a ride on one of those enchanting red trams over the rest of Ringstrasse. Schwedenplatz was the nearest tram station from where tram no.2 would take us straight to our apartment. That was a pleasant ride, as it passed by some of the most magnificent landmarks like City Park, Opera House, Museum Quarter, Burggarten (Palace Garden) and Hofburg Palace. It was evening already and the buildings were illuminated with bright lights, their magnificent form shining like jewels against the colourful twilight sky. It was a memorable evening indeed. Beautiful pictures and wonderful description.